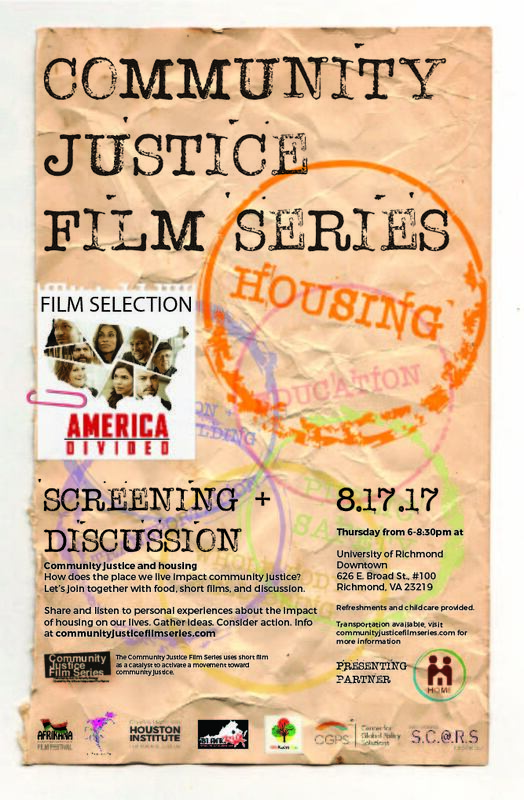 In August 2017, the Community Justice Film Series, in partnership with Housing Opportunities Made Equal (HOME), examined community justice and housing. There continues to be a housing crisis in America. It came long before the Great Recession in 2008 and continues to impact communities of color and poor people across the United States. Unaffordable, unsustainable housing contributes to instability, poverty, health inequity, and a variety of other quality of life factors. Read the op-ed published in the Richmond Times-Dispatch by film series partners to learn more. Approximately 75 community members joined HOME and the Community Justice Film Series to watch the following documentary and create ideas about how to address community justice in our failing housing system. In the run-up to the 2016 presidential election, America Divided, the EPIX Original limited docu-series executive produced by Norman Lear, Shonda Rhimes and Common, features narratives around inequality in education, housing, healthcare, labor, criminal justice and the political system - all woven into an eight-story, five-part series. America Divided: A House Divided explores the housing divide in New York City. More info at www.americadividedseries.com/a-house-divided.